Though the first magazines with pumpkins on the cover have hit the shelves, I am not quite ready to let go of summer just yet. I want to enjoy my favorite season until the very end, and I especially want to get the most out of the flavors this time of year has to offer. Summer cooking is as easy and carefree as the season itself. No-cook meals such as salads, beef or fish tartares and cold soups are quick and often very healthy, but sometimes, even on hot days, I will suddenly get the urge to roast a chicken — which happens to be my husband’s favorite food. He still recalls going out for dinner with his parents on their anniversary and always ordering the same thing — roast chicken with fries and mayonnaise. You can imagine his delight when he sees a meal like this on the table! And our delight, too, because last night’s dinner was perfect in every way. From the lemony, crispy-skinned chicken to the conversation and love shared around that table. Because food and eating together as a family, you see, is and should be an immense source of pleasure. 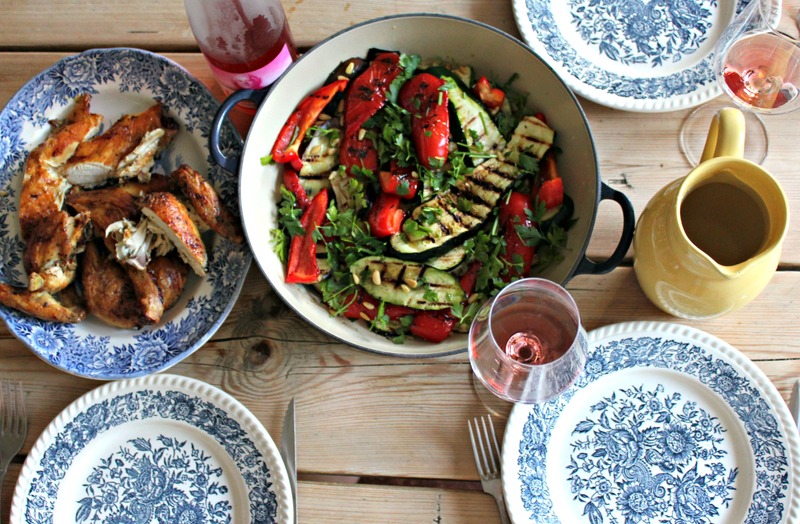 When Hans texted me on his way home from work to ask if I needed anything, I had a chicken marinating in the fridge, and on one of my vintage French plates, a pile of freshly-washed summer vegetables was waiting to be sliced and grilled. The wine, a rosé purchased in Spain just a few weeks ago, was chilling in the freezer. The only thing missing was something for our apéro, so I asked for some olives. After a day of work and the hurried pace of everyday life, the three of us sat down to our well-deserved drinks and nibbles, while the chicken roasted and French music played softly in the background. Today I am sharing these two recipes with you. Serve them on pretty plates, savor the moment and enjoy. The key to a quick cooking time is to spatchcock your chicken. This simply means removing the backbone and flattening the chicken. You can ask your butcher to do this for you, but with a pair of heavy-duty kitchen shears or a sharp knife, it’s really not that difficult. I always save the backbone for stock, so nothing goes to waste. Season the chicken on both sides with the chili flakes, oregano, salt and pepper. Put it in a large Ziploc bag, cut the lemon in half, squeeze in the juice and add the garlic cloves and olive oil. Marinate in the fridge for at least two hours. Take the chicken out of the fridge about half an hour before cooking. Preheat the oven to 200C, place the chicken breast side up on a baking tray and pour the marinade over the chicken. Bake for 20 minutes and then flip over to bake for another 20 minutes. Flip the chicken again and give it a final 20 minutes. Allow to rest for 5-10 minutes before carving. This is such an easy way to bring out the flavor of perfect summer vegetables. I don’t think it’s really necessary to write out a full recipe. Just heat up a grill pan and griddle your vegetables, placing them on a serving plate as you go. Once done, sprinkle with roasted pine nuts and fresh herbs, season with salt and pepper and drizzle with good olive oil. For the three of us, I used one large aubergine, one courgette and two red bell peppers. « Learning French (the Gourmet Way! 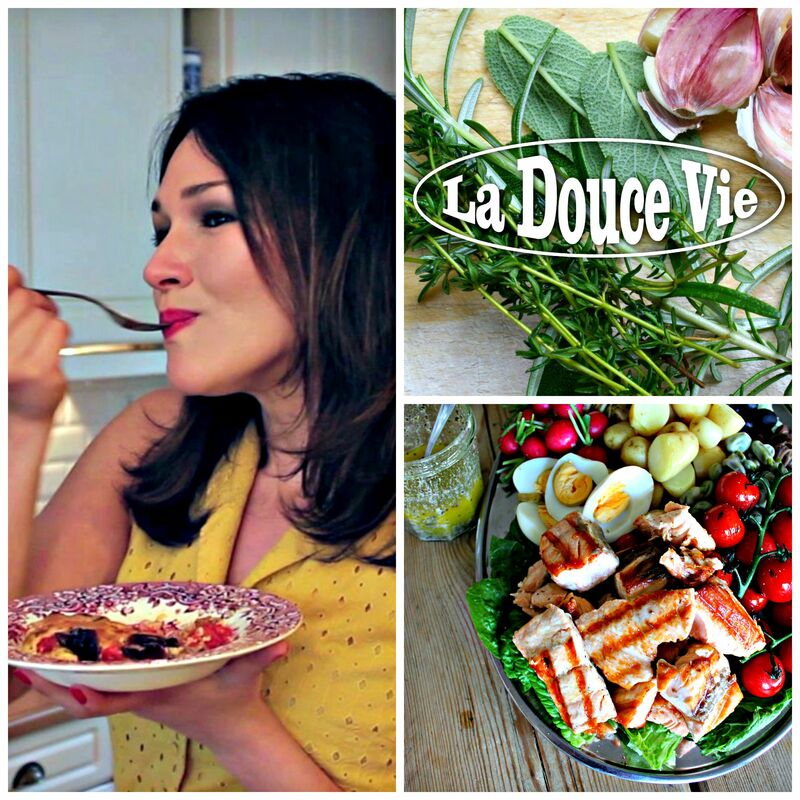 )… and Cooking with Julie Andrieu!